Photo of: Midlands of Ireland: Tipperary: Cashel. 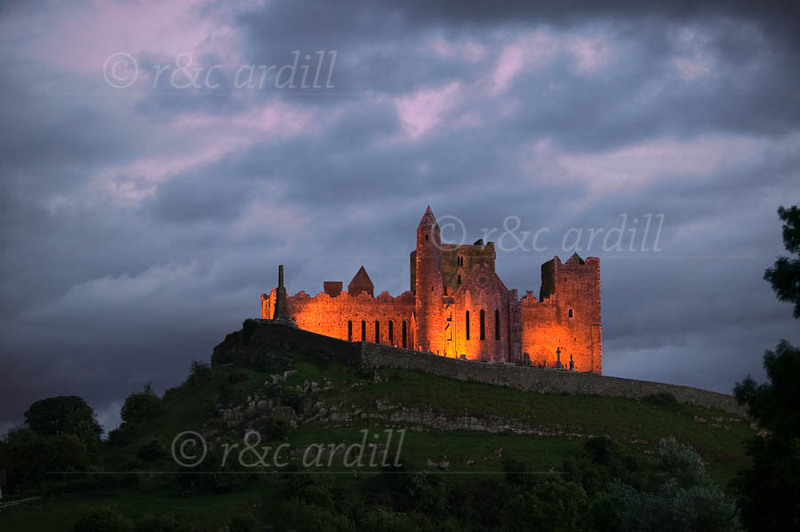 This image is a photograph of The Rock of Cashel after sunset. There is still a little light left in the sky. Cashel, also known as Cashel of the Kings, is dominated by the huge and iconic castle known as The Rock of Cashel (Carraig Padraig or St Patrick's Rock, as it was formally known). It is reputedly the site of the conversion of Aenghus the King of Munster by St. Patrick in the 5th century AD. Long before the Norman invasion of Ireland, The Rock of Cashel was the seat of the High Kings of Munster. Most of the buildings on the current site date from the 12th and 13th centuries when the rock was gifted to the Church. It is one of the most remarkable examples of medieval architecture to be found anywhere in Europe.